and the instructions found here: Women-Art-Life: Weaving It All Together. Of course there are others ... but I'm only hitting a few here. You are all women artists who inspire me, with the yarn, the words, the photos, and just who you are. I stopped by Knitter's Knook, one last time tonight. I couldn't help it. The final week: 65% off. Two skeins of Baby Alpaca Lace in navy. Two balls of sock yarn. A ball of Mango Moon mohair. 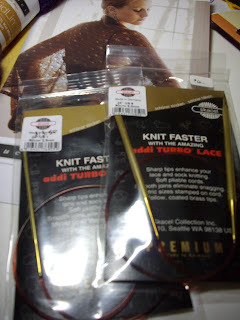 And a size 0 Addi Turbo (16-inch) - I'd have gotten two but she only had one. And I wanted to take more, but I did reign myself in (ok, just a little). Becky and I chatted for an hour. The store closes for good on Friday evening. I didn't cry. But I surely felt like it. I hope she didn't after I left. She's got a cold, crying would make her feel worse. Becky? Every best wish I can think of, I'm sending your way, love. Thank you. I'll miss you. And see you very soon, I know. Stay safe in your travels. Godspeed. So were I to win? 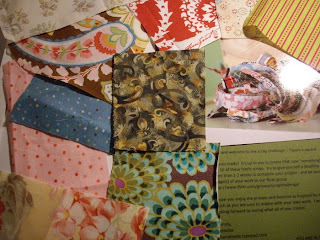 My best and favorite three colors for such a lovely little quilt would be .... hmmmm .... sage, burgundy, rosy pink! Thanks for the opportunity, JC! Our local electric utility, thinking, I presume, that we're not already hurting enough these days of economic strife, has petitioned the State Corporation Commission for a 21% rate hike. It goes into effect on Nov 1. This on top of the 12% hike that went into effect on Sept 1. Of course, the SCC could make them refund it, if they find it unnecessary. A bit over a year ago, they hiked everything 25% and the SCC denied it...the refunds took a bit to come through and you can never understand the bills to see if the refunds are correct or not. When I heard about the electricity rate increase? I did exactly what folks aren't supposed to do. I headed to Barnes & Noble. And found these two magazines. 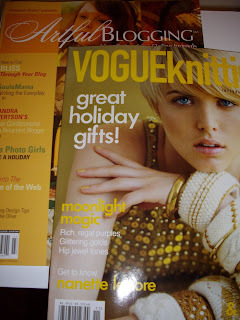 I looked at all the Holiday knitting magazines, but was only tempted to get Vogue Knitting's Holiday issue. But behind it? That's Artful Blogging. I hadn't seen it before and frankly, as expensive as it was, I'm not sure I'll get it again. But the photography is stunning. I know a few of the blogs mentioned in this issue, and intend to become more familiar with the rest of them. Perhaps it's just eye candy. Or maybe you'll see something change around here. After all, with everything going up and up? I'm probably going to be spending a lot more time at home on the computer! 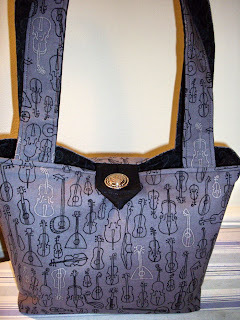 I understand there will be a few musicians attending at least one of the shows so there's one music bag in there, and the stripe is a really neat black ticking with tiny wine rosebuds (I know who gets this one, if it doesn't sell! 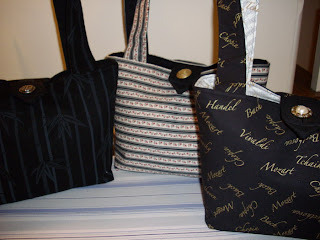 *wink*) The other bag is an Asian-influenced print of bamboo (black on black). I'm hoping for a calm week. And a productive one. Hope your's is, too! Saturday was spent cutting and fuztying with bags for the Northern Virginia Shows my Big Sis and a friend of hers are hostessing for me in two weekends. I'm trying to hurry, but we all know that can pose problems. 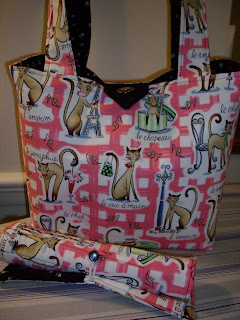 Finally, this evening I said, "I go up with what I can get done, and the rest is fabrics for orders! It does take a bit of stress off the plate. The Knotty Gloves in STR lightweight colorway Mustang Sally. I love them. But this wasn't exactly intuitive. 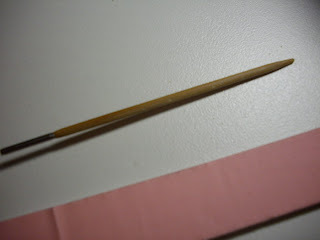 The next one, of course, will be reversed (I bet the photo of that one will be WAY better - as I'm right-handed! Using my left to take this photo wasn't easy! 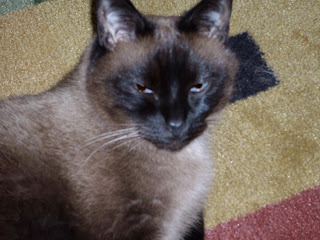 The Meezer has been underfoot and nearby all day. 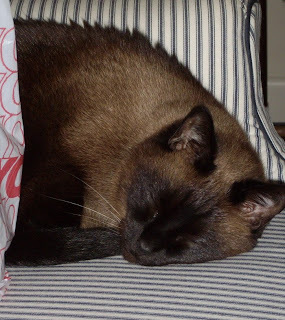 At one point, she vaulted from the back on my wingchair to the back of it's mate (I was very glad there was no one sitting in it as her bulk almost sent it careening to the floor). 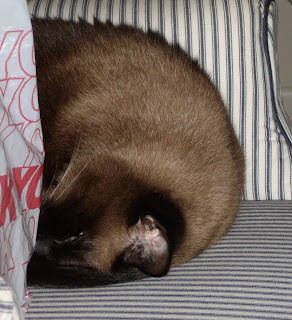 In between the two chairs is a stereo system, with a stack of CDs, and a heavy Ott floor lamp which could have created quite a mess had there been a paw's breadth of misstep. And your point, Mom? Please note that I did not create chaos. I knew exactly where I was headed and how much power I needed to launch myself and land without a speck of trouble. She's never been a climber. But then, she's never been a lapcat, either. Suddenly, she's both. I'm sitting here scratching my head wondering how on earth it's already Wednesday (not complaining, as it means we're closer to the weekend, but still - things are going so blasted fast!). 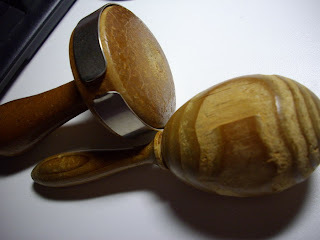 They were my mom's and quite possibly her mom's (or an aunt's) before her, especially the egg-shaped one. They're quite worn, but then my mom was a teenager (the eldest of 8 children) during the Depression Era and a young wife in the WWII years, so these probably got a lot of use. Neither her family, nor my dad, had much money. 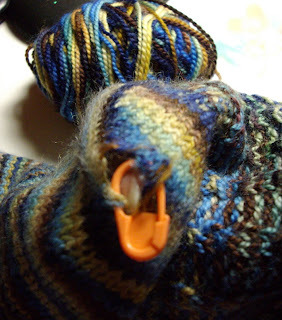 Darning was something she knew how to do. I wish she'd passed that along to me, but I think I can learn, anyway. And on the subject of darning, and in the interest of answering a couple of comments left for me today: I think the yarn colors are playing tricks on folks. My gauge is spot-on with both of those socks. But dark, dark colors tend to make things look smaller (which is why I wear a lot of black, navy, gray, and dark purple! teehee!) and lighter colors make them look larger. 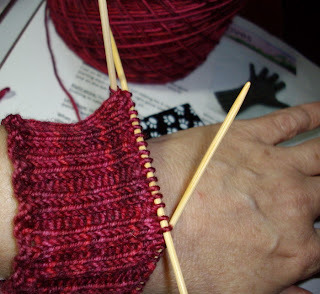 Both of the socks in the photo yesterday have a stitch count of 7.5 stitches to the inch on size 1.5 needles. 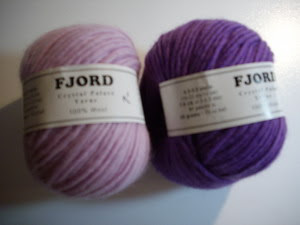 I've compared both of the leftovers of these yarns and there's a definite difference in how they feel. How about the twist on them? The Claudia is not as tightly spun as the CTH. I just can't in good conscience toss these socks. For one thing, I LOVE the colors. And you know the Nana is all about the colors, right? But it's more than that. It's that I was raised by that Depression Era teenager. 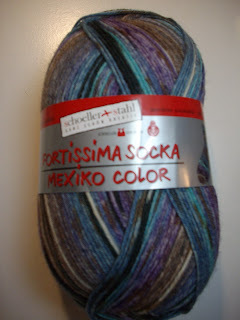 When one spends what I do for sock yarn (which would have mortified my mom!) - I just can't toss the socks when a hole appears. They may just become "around the house" socks, but that'll be fine with me! I did start another pair of socks this week - have to have something totally mindless to knit at lunch and at traffic lights. Yes, I've started to do that again. Since I learned to read and knit, somehow it's easier to sit in the car and knit at the lights. I do not hold the needles in between lights either, so don't shoot me, okay? 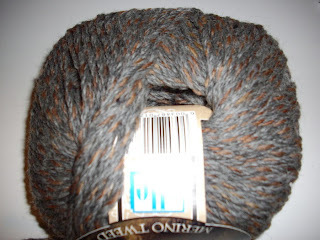 Trekking XXL in colorway 66 - shades of black and gray. I'm going to make very simple socks, but haven't decided if I'll make them the stockinette with picot edge or Wendy's Easy lace pattern that I've used before. I do so love my Trekking. 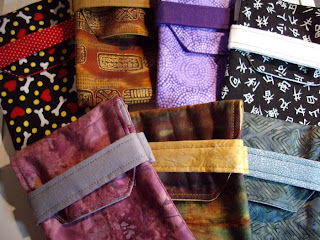 Seven more Fiona cell phone cases are ready. I am not really certain where summer went. I know it was here, because I remember closing the books every month. I guess that's my answer. The summer, as always, went the way of work. 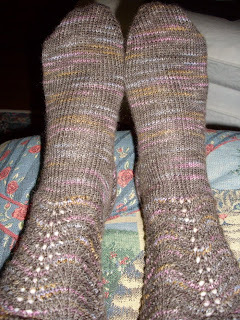 Way back a year ago...I knit my only pair of Claudia Handpaint socks. 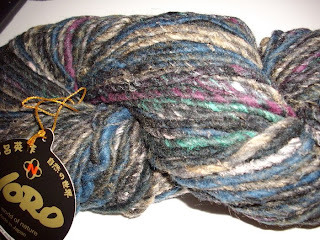 They were the Ingrid's Blues colorway, which I liked a lot, and to begin with I had problems just getting the yarn into a ball...(I believe I called it Claudia Spaghetti, but I finally did get it wound up). I knit a lovely pair of socks, in only a month...which was a huge improvement over another pair I'm going to talk about...the Cherry Tree Hill Green Mountain Madness Feather & Fan socks. Those were started TWO years ago, and finished a mere 6 months later...yes, to say I have progressed in speed, is a bit of an understatement. 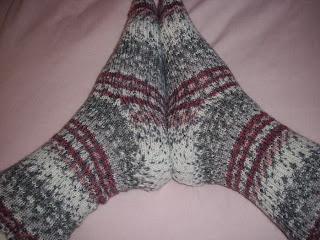 But here is a comparison of the underfoot of both of those socks. The left one is the CTH. It's 6 months older (and a lot more "time on the hoof") than the sock on the right, the Claudia sock. So here is another knitting rite of passage...My FIRST sock hole, after only a year of sporadic wear. 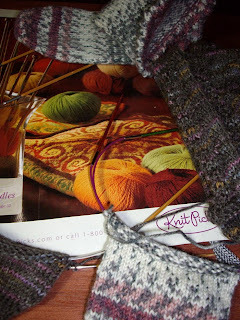 How many of you sock knitters darn your socks? I will darn them. If only because it's an art form I'd like to add to my repetoire. No. I like the socks, too...Hmm...wonder where my mom's darning egg is? It's been one of those Mondays...BUT. It was on the envelope that enclosed this! It's been a long week. I'm looking forward to making something warming and wonderful to eat this weekend - the temps will be in the 50s during the day...and some freeze warnings in the deeper valleys around tomorrow night - just the right weather for soups and stews, and bread...Perhaps for knitting by the fire at Panera (and maybe some of their bread, since I don't bake). 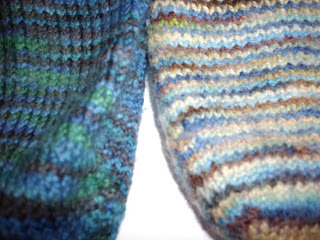 Trekking 172 Feather & Fan Socks knit on size 1.5 Hiya Hiya bamboos. Love them. 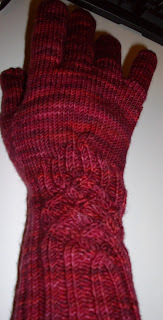 Knotty Gloves in BMFA STR in Mustang Sally. 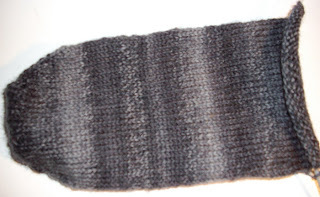 Let me tell you, I'm in love love love with this ribbing. I have never been so happy with the quality of the rib. I don't think it's me. This yarn is scrumptious and has such stitch definition! Plus the color is divine. I'm thinking all kinds of things I want in this colorway. Anyway...this weekend will be sewing again. With a bit of cooking and knitting in between the chores, too. I'll say one thing...all these debates have encouraged a LOT of knitting on my part! 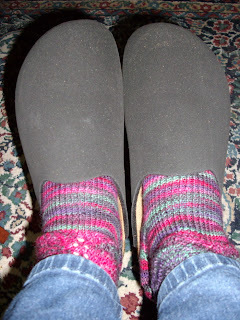 My new Birkies (with the Northern Lights Feather & Fan socks). I have my fingers crossed. I've worn them half a day yesterday and today as well. My foot feels better, but is still a problem...still I'll take what benefits I can get! 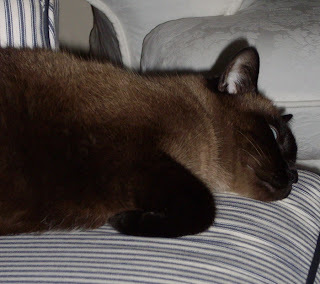 How I wish I could relax like that! And please, make me eat my words if I go back on this? 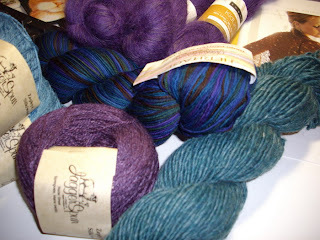 I'm making lists of all the stash I'm going to knit up (and WIPs that will be completed - promise!). Noro Iro color 63 for "My First Vest." The pattern arrived also (but was bought at NoSoKnit a couple of weeks ago). No, not casting on yet...WIPs to finish, remember? As much as I love this yarn, it'll probably end up in the Daily Sweater. 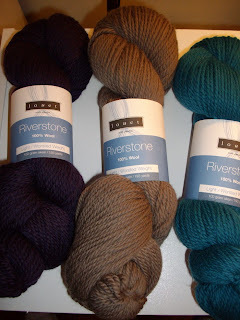 I do have one more skein coming (found it on Ravelry, whoohoo!) of the Green Mountain Spinnery Cotton Comfort. I'd hoped to use the 7 skeins I bought Sunday at Knitter's Knook for Cheryl Oberle's Sampler Stole from Folk Shawls but I was just 1 skein short of the yardage. 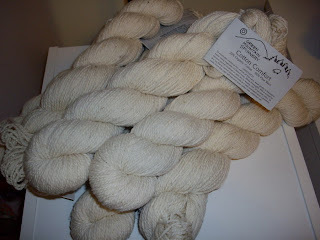 I'm hopeful that since the yarn is "undyed" it won't be that much different ... Keep your fingers crossed for me, okay? 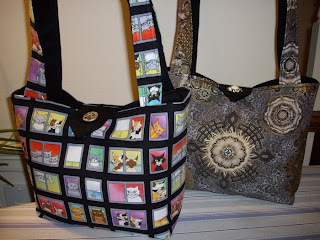 Still and all, the cat show bags are finished and ready to ship, the vet's books are done for another month, the quarterly payroll reports filed. Isn't this a striking set? 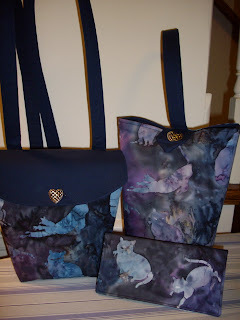 The lady wanted everything to coordinate (and no, they're not identical, you know I make each bag just a touch different here and there, right?). A Grace, a Posy, and a checkbook (this fabric is almost gone...a beautiful Hoffman batik cat print from a few years ago). The invitations are going out for the Home Shows at my sister's in Northern Virginia on November 8th (there'll be two that day, a morning and an afternoon get-together). If you're going to be in the area, or if you already live there, and would like to come to either one, let me know, okay? But tonight? There's still dinner out with my sis-in-law and the first Roanoke Symphony Masterworks Concert of the season! And one of our favorite cellists is back! Guess I won't need SIL to nudge me awake after all, Zuill Bailey is such a talented young man (and good looking, too!). 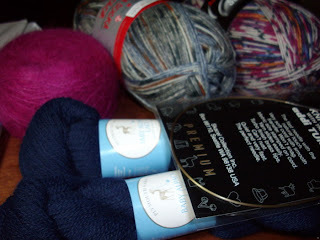 ...which when combined with black will make a wonderful felted bag for me...I have some of the teal for my February Lady Sweater, so the bag and socks are a necessity, no? Tell me I'm not just being nostalgic in the face of losing Knitter's Knook? And here, two Kerris, one with the Condo Kitties and then another one that a great medallion print in ivory black and gray with gold etching. It's a beautiful print. 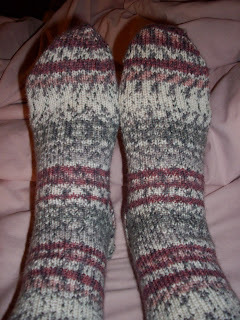 And I managed to finish my sis-in-law's socks! I'm so pleased with the way they matched up! And frankly, they're so lovely and warm? I don't want to give them up...but I will. It's been a busy day. 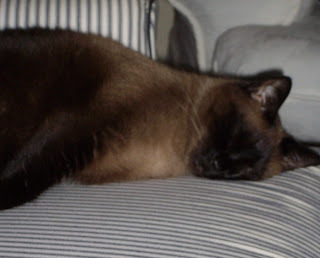 Tomorrow (today, actually) I'll have the vet's books to get done before I make a trek down to Knitter's Knook...and before the weekend is over, I have one more order to complete from the cat show. I'm really glad I have Monday off! When I Got Nothing - I Find a Meme! There was another one, Lifelines, that I can’t seem to remember the author of. I’ll try to find the book tonight at home and edit this…written by a woman in the 1980s and about living through the loss of her husband to cancer (eta: the author was Lynne Caine and the book is out of print). Oh my yes. The Women’s Room and The Handmaid’s Tale, specifically, and lately? A Time to Fight: Reclaiming a Fair & Just America , by Virginia Senator Jim Webb. I usually read by subject. So whatever my current fascination is – ie: knitting, voluntary simplicity, vegetarian cooking, the current political environment…if non-fiction; then, women’s fiction (even historical romance/bodice-rippers, not just present-day “true-life” non-fiction. I also particularly enjoy Susan Wittig Albert’s China Bayles mysteries with a herbal theme…Just call me eclectic! It’s about 50/50. Either/Or. Depending on my mood. Viviane in Mists of Avalon. Animal Vegetable Miracle, by Barbara Kingsolver – I didn’t completely finish it before having to return it to the library right after the cat show…and it was late. Frankly, tho’ it was interesting, and the setting is not too far from where I live, I just was having a rough time working through it while handling the mechanics of my sewing business. The last one I completed was Sister’s Choice by Emilie Richards – a fun frolic! 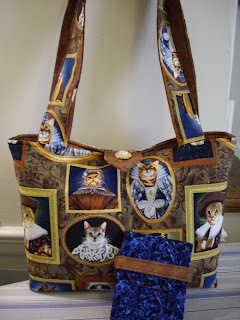 And I finished it before the National Capital Cat Show in September. So other than flipping through MDK Outside the Lines, I'm not reading anything really right now. Often. Why waste my time slogging through something I can't stay interested in for whatever reason. I love books. I collect books. I love to hold books while I read, but lately, it's been easier to listen to books. So I've spent some lovely evenings knitting and "reading." Or sewing and "reading." I would never have thought of audio books as a possibility for me, but they've been wonderful! Even tho' this particular news junkie is swooning over the political and financial news that's non-stop, and completely over-the-top these days (and yes, even I am on overload), there are some normal things going on in Knitnana's life - and some that are not normal at all! Can you see it underneath all the sock knitting going on? I have to tell you that whoever Knitpicks has doing their photography on the cover and first pages is doing a really good job of making me think of Victoria Magazine...Very, very artsy. I'm seemingly into challenges these days: scrap challenges, knitting challenges. Challenging the conventional wisdom about Plantar Fasciitis. Oh, that one slipped in there, huh? Well, it appears that the hard orthotics are causing me enormous pain (I knew I was in pain, but when it's the feet? Pretty hard to say - THIS spot...it ALL hurts!). The "off the shelf" orthotics have the arch support hitting me about 1 inch above the true arch of my foot. I had noticed the bruising, but didn't make the connection. I saw my rheumatologist for my routine checkup yesterday and heard, "If those rubber/plastic shoes are cushy, and your feet feel better, I'd say, go get yourself some thick foam inserts and see if that doesn't feel better...two steroid shots is all you can have awhile, now anyway" So I did. And put them inside my Birkenstocks. Um. Only one day later? I'm still sore, but I'm sooooooooo much better. The last thing my rheumy said before I left? "Everyone's feet are different, and treatment of Plantar Fasciitis is pretty individualized." I like that so much better than hearing "You can never wear any shoe but a jogging shoe with these hard orthotics for the rest of your life; you can never go barefoot again!" There was one more, of course, but I try hard not to show duplicates too often. 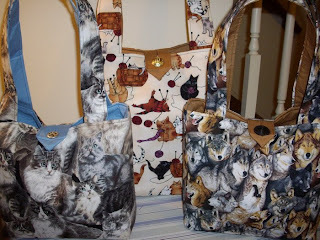 And please note that there is ONE bag that's NOT cats! It's WOLVES! 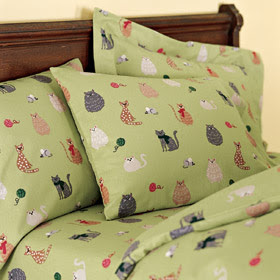 I keep telling you all I do more than cats, and that's the proof of it! 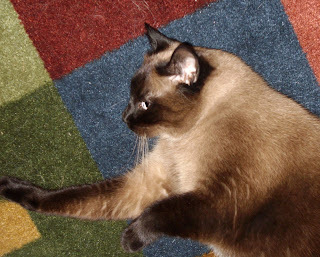 I've said on many blog comments that I don't seem to have a problem with The Meezer going after yarn, and other than one 10.5 dpn that has gone missing (and I'm pretty sure is in a dark corner that will only be found when I move) she's always left the needles alone. And then suddenly - WHAM! - I realized she was at my Posy Sock Sack, with MY Trekking socks inside...and there was a dangling thing that was whipping around...! The Meezer wasn't impressed by my stern talking-to...Why don't you find my tearstrip and then I'll leave your dangly things alone? FO! FO! Alert! Habitat is OFF The Needles! It's still damp, but I couldn't wait any longer to model it. 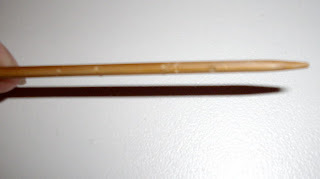 Needles: Harmony 16-inch circulars, size 7 and 8, and Plymouth size 8 dpns. I did get off in the patterning of Habitat somewhere in the last few rows, I think, but I'm not sure exactly where. The top of the hat isn't quite what I think it's supposed to look like. But there are broken cables in the pattern, so maybe that's just what I'm looking at? Anyway, it's pretty. 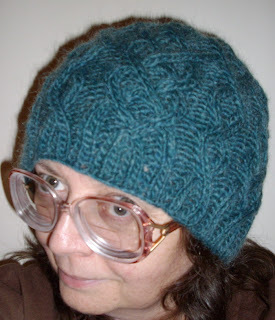 I knit it for me, so broken cables (right or wrong) don't seriously bother me. I mentioned a few days ago that my favorite LYS is closing. She's not leaving us for economic reasons, but instead for matters of the heart. Off on adventures with the man she loves, and who, pray tell, can fault her for that? Surely not I. 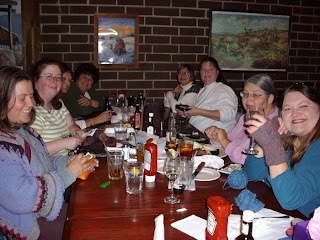 Others have mentioned that it's a bittersweet event that's taking place now at our beloved Knitter's Knook. A store-closing sale. It is, indeed, difficult to do. 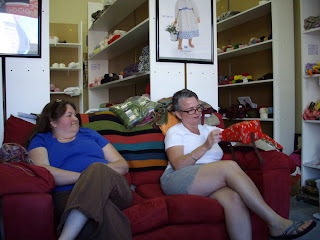 We love Becky so much and the store became a huge part of our lives in a fairly short period of time. It was a bit hard to visit Friday after work, knowing that, while I was about to help her remove stock from her shelves (and stash enhancement is such a wonderful, fun event), I wouldn't be seeing her nearly as often and that would happen very soon. 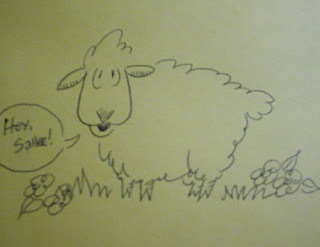 She'll be back now and again, and will keep in touch, via Ravelry. Still...it's just so darned sad to say good-bye...But I did help her with lowering her inventory and I'll be back for more (that Log Cabin blanket needs a bit more yarn, but I'm not quite sure how much yet!). Three skeins of violet Kidlin for Lilith from Louet (yes, I bought the pattern, too); a skein of Cascade's Heritage Handpaint Sock yarn; two cakes of Zephyr laceweight in Peacock and one in Plum. I also picked up another skein of Green Mountain Spinnery's Mountain Mohair to finish my Habitat hat...it took a bit more than I'd hoped. I've finished Habitat and it's blocking now. I'll show you that tomorrow. You're obsessed with Camelot in all its forms, from Arthurian legend to the Kennedy administration. Your favorite movie from childhood was "The Sword in the Stone". But more than tales of wizardry and Cuban missiles, you've focused on women. You know that they truly hold all the power. You always wished you could meet Jackie Kennedy. Note to self: buy the remaining 3 books in Barbara Walker's Treasuries to go with the rest of the books by her on my bookshelf! And maybe it's time to re-read Mists!